If like many, you are struggling to cope in today’s bookie dominated world, then the release of the latest Smart Betting Club magazine is here to help. Whether its learning how to get your racing bets on, understanding how bookies identify ‘shrewd’ gamblers or how to build sustainable betting profits, it has something for you. To help get the real truth on bookmakers, we have gone behind enemy lines and recruited an active betting industry employee to spill the beans. He has signed up to be SBC’s industry mole and will be reporting back regularly via our future reports. 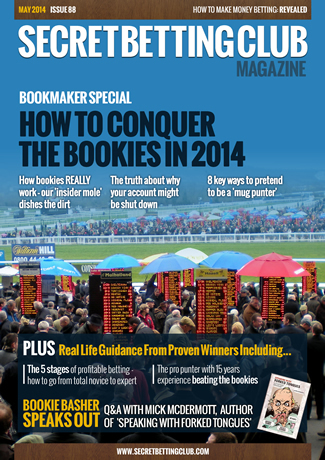 The latest SBC Magazine has just been released, which this month has a focus on bookmakers and everything you need to know on beating them in today’s ever-changing betting world. As we all know, some bookies are no longer willing to play fair and our special report provides you with the real behind-the-scenes truth on how to stay one-step ahead. It also reveals how you can evolve your betting on alternative sports and bookies to make sustainable long-term profits. This week signaled the 8 year anniversary of the Smart Betting Club, during which time it’s fair to say the landscape of betting has certainly changed a fair bit! Back in May 2006, the dreaded FOBT’s were just a twinkle in Fred Done’s eye (or glow off his shiny bonce) and punters could get their bets on with comparative ease on sports such as horse racing. Since those heady days a lot has changed, and most of it firmly in favour of the bookmaker – at least for those punters operating without the right expertise to navigate them through the present day betting minefield. The key in such a changing world is to adapt and learn to bet not only on the right sports but at the right time and with the right bookmaker. That last point is key as understanding how the bookies work is vital to our future success, which is why here at SBC we are due to release a very special bookmaker-focused magazine tomorrow. For one month we are taking a break from uncovering and reviewing profitable tipsters (that will return in June!) and instead have compiled a guide to what you need to know about how the bookies work in today’s modern betting world. Grab A Top Tipster Bargain During ‘Money-Saving May’! Did you know that with a Smart Betting Club membership, you can save thousands of pounds on subscription fees to some of the very best tipster services courtesy of our Discount Club? …That’s not all though because this month we are stepping it up a notch with the launch of something we have termed ‘Money-Saving May‘. Its been so-called as throughout the month, SBC members will be able to take advantage of some unique saving deals and discounts on many popular tipsters. So much so, its no exaggeration to suggest these deals could save you the cost of a Smart Betting Club subscription many times over!